We’ve been focused this whole time on games which attempted to emulate the 2D overhead perspective style Zelda games. The time has finally come to talk about one of the few games which tried out the more modern 3D style. One of the final games released in the Mana series, Dawn of Mana attempted something brand new to its franchise. 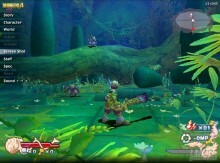 Using Ocarina of Time–and similar subsequent games in the Zelda series–as a blueprint, Dawn of Mana attempted to follow Zelda into the new dimension. Which is only fitting begin that the first Mana game (Final Fantasy Adventure) did its best to clone a lot of what made 2D Zelda great. Arguably, Final Fantasy Adventure even improved upon those older Zelda titles by adding more weapons, spells, and even RPG elements such as experience points and leveling up system. We have, however, already discussed that game. Let’s move forward and into 3D and see what happened when the Mana series decided to borrow a thing or two from Ocarina of Time. While Nintendo was looking to innovate its major franchises, being one of the first to provide huge 3D worlds full of action-adventure gameplay in both the Mario and Zelda franchises, many other companies played it safe. In this 64-bit era, many developers stuck to sprites instead of 3D models. The beloved Dragon Quest series could certainly have moved into full 3D and still sold tremendous amounts, but Enix refused to take the risk and stuck to sprites for that generation. 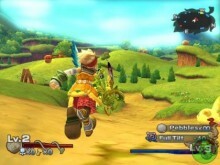 Similarly, Square chose to stay traditional with its Mana franchise. While Nintendo was innovating and bringing Hyrule to life in full 3D splendor, Square chose to play it safe and released another overhead perspective style game for that era’s entry in the Mana series. 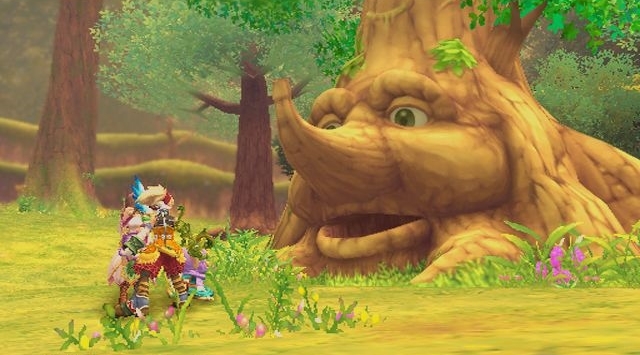 This game was the beautiful–but convoluted, and possibly the worst of the series–Legend of Mana. While Nintendo allowed you to feel like you were actually in Hyrule, exploring the massive land in full 3D, Square provided yet another 2D adventure of sprited graphics. 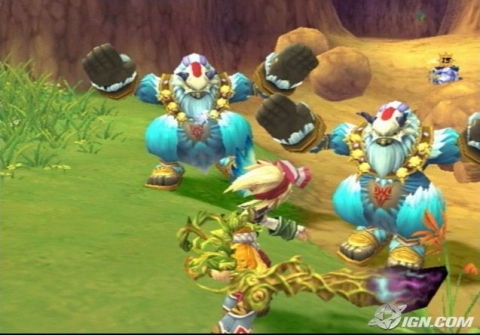 As beautiful as Legend of Mana might have been, it did not capture the imagination quite like Ocarina of Time did, so Square made sure that the Mana game to be released in the following generation, on the PlayStation 2, would borrow a thing or two from 3D Zelda. And then, in typical Mana fashion, they would simultaneously improve upon and do worse than Zelda. However, unlike Zelda, Square decided to give Mana a jump button. This seems like a peculiar decision in retrospect, because unlike Zelda and its Roc’s Feather/Cape, there has never been any jumping of any kind in Mana. Why they decided to defy their own tradition, not to mention buck at Nintendo’s wise choice to not over-complicate things with a jump button, seems very strange to me. The result is what Zelda fans claim they want from Zelda in theory… yet Dawn of Mana proves why this is actually a terrible idea. Adding platforming to an already very involved battle system is a recipe for… if not “disaster”, then at least convolution. And let’s talk about that “very involved battle system”. 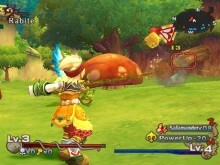 Just like in 3D Zelda, the main character of Dawn of Mana attacks primarily with a sword. And while he does have a varied arsenal of additional weapons, they are not nearly as varied as those in other Mana titles. This time around, besides your sword, you have a whip and slingshot. And while these don’t sound like particularly thrilling additional weapons, they are actually used in fascinating ways. You see, enemies are easily startled if they don’t see it coming. So if you can shoot your slingshot at some huge rock teetering up on a branch and drop it down into a group of enemies, you will send them into a de-buffed panic. Your whip can be used similarly: you can grab hold of a boulder with it and send it hurtling into a group of enemies, cutting your job in half at least. Over the course of the game you will meet up with various elemental Spirits who will give you the ability to use your slingshot and send an orb of their particular element at enemies, causing a wide variety of damage and havoc. Some bosses are only weak against certain of these elemental projectiles. So, unlike Zelda, there is no wide range of tools to be acquired, each in a different dungeon. Another major difference is that the game featured orchestral and other “live” recorded instruments long before it was finally offered to us in Skyward Sword. And Dawn of Mana offers up something that remains wanted by many fans from the Zelda franchise: voice acting. And I have to say: while I am not a fan of most voice acting, I actually feel like Dawn of Mana did a remarkably good job. The game also gives players something that Zelda fans have been demanding for quite some time: multiple difficulty levels. Yet, I have to say, even “Easy” is often more difficult than the usual Zelda game. One unfortunate thing that Dawn of Mana shares in common with Zelda is linearity. In fact, Dawn of Mana commits this sin to a greater degree. The game is divided up into chapters, with each chapter focusing on one area. Once you’ve finished that area, you can never again return to it. This is where the game falls apart. One of the most awesome things about the previous Mana games was how gigantic they felt with countless towns to visit, each with a different culture and shops to upgrade your equipment and items. If you didn’t feel comfortable with the next dungeon, you could stock up on restorative items and hope those would get you through. Not so in Dawn of Mana. There are no shops at all, as you are transported from area to area via cutscene. The effect is extremely narrowing and claustrophobic, despite the massive dungeons. And the dungeons are massive. Sometimes a “dungeon” will be an entire continent full of shoreline, caves, ships, fortresses… all in one area. And what’s absolutely awesome about Dawn of Mana is that despite its annoying chapter-to-chapter linearity, the actual “dungeons” themselves are designed to have at least two completely different ways to reach the end. I remember stacking up a bunch of boxes, trying to jump over a wall, certain it wouldn’t actually work… and then found to my surprise I was able to jump over that wall and had discovered a completely different route to the end of the area! Yet another thing that Dawn of Mana offers that Zelda fans seem to want but never get is a bit more atypical of a story. Without giving too much away, let me just say that I am certain that Zelda team would never end a Zelda game the way Dawn of Mana ends! And I have to say that the ending is possibly more epic and awesome than that in any Zelda game. Dawn of Mana is also more akin to Zelda than to its own series in that the RPG elements have been completely removed. No longer can you level up or gain experience points. You simply have to rely on your new elemental powers you’ve gained along the way to help you out with the increasingly more difficult enemies. So while I cannot really recommend Dawn of Mana to fellow Mana fans, I feel like it is much more suitable to Zelda fans anxiously awaiting the next Zelda game. Have you played Dawn of Mana? What did you think? Let me know in the comments! The editor-in-chief for Zelda Dungeon, Bastian spends most of his time at the site recruiting, hiring, training, and editing nearly all of the writers you read here. He regrets that he has so little time to do much writing himself, but thoroughly enjoys it when he can. You can sometimes catch Bastian on Zelda Dungeon’s YouTube channel reporting breaking Zelda news, or reporting Nintendo news nearly daily on BastianTime, his own YouTube channel.